Many of London’s old rivers have been lost, buried beneath centuries of urban expansion, but some still flow into the Thames. The River Roding, in eastern London, is one such river, joining the Thames at Barking Creek in the east of London. Canoe access can be made at Creekmouth, where free on-street parking is available on River Road. Shoulder your kayak and walk through Creekmouth Open Space – the path leads to a good set of steps which descend to the mouth of the river. The huge guillotine of the Environment Agency’s flood defence system towers above the river here, ready to slice down if river levels rise too high. This impressive flood defence system hangs over Creekmouth, where the River Roding meets the Thames. It was close to this spot that one of the UK’s greatest maritime disasters unfolded in 1878 on the River Thames. Over 650 passengers of the Princess Alice died when she was struck by the SS Bywell Castle, an unloaded collier vessel heading downstream with the tide. These days the mouth of the River Roding is a quiet spot, with only the occasional fisherman awaiting the bite of a Thames bass or flounder. Check the tide tables at the Port of London Authority’s website and use the incoming tide to take you upstream. You ideally want the tide to be at full flow, with most of the mud flats covered. On the eastern bank, heavy industry and warehouses turn their back to the the river, with only the occasional wharf still active. To the west, Beckton sewage works is obscured by high reeds. Despite the unpromising surroundings, there is a rich variety of bird life, including shelduck, suggesting lots of maritime life in the plentiful mud. 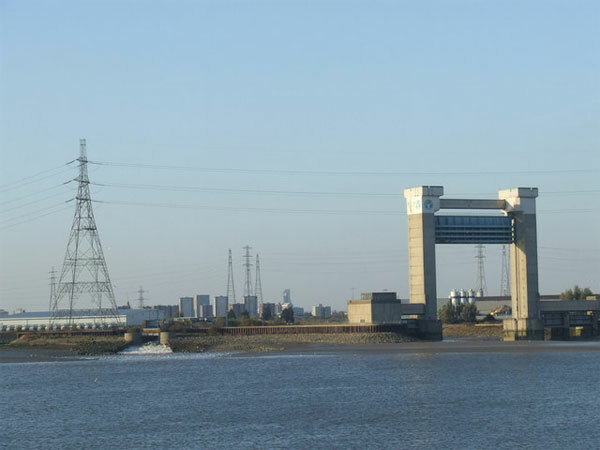 The river passes under the busy A13, and the sound of rushing water indicates the arrival of a large weir and lock. This can be portaged, awkwardly, via floating pontoons. Access off the pontoons may be blocked by locked gates, but I was able to manoeuver a kayak over the gates and to climb around them, with care. Having left the tidal stretches of the River Roding behind, a community of house boats nestles two and three abreast along the river, before the river opens out into the pool of old Barking Town Quay, overlooked by the Old Granary mill. This is about as picturesque as the lower stretches of the river get – as the river then loosely follows the route of the North Circular, snaking between muddy banks, largely hidden from the tower blocks and back gardens around it. 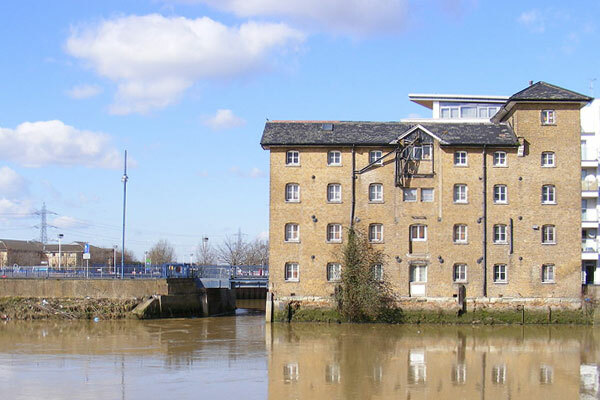 Barking Town Quay and the Old Granary. This site was once a busy commercial port. Water quality varies widely – ranging from brown, scummy soup to sparkling, clear water in which shoals of small fish dart. Urban rubbish abounds, skeletal supermarket trolleys dot the banks and tyres litter the river bed. Rather like a fenced off railway embankment, rubbish is discarded onto the River Roding’s banks, out-of-sight and out-of-mind. With a low spring flow I was struggling in my kayak by the time I got to Manor Park, where the river flows beneath the railway lines and the six lanes of the North Circular. An illusionary glimpse of countryside is granted by Ilford Golf course, but this was as far as I got – defeated by the downstream current and the Roding’s shallow stream bed. According to Southend Canoe Club, there is another section upstream, described as a ‘big ditch’. As they suggest, a downstream trip would be a better option if you are able to run a shuttle – but get your tide timings right as you will want to finish on a dropping tide. When I ran the River Roding the Environment Agency gauge at Redbridge read 0.29 metres. The trip there and back took three hours. More water would make for a better, downstream trip, but high water would present a danger from trees, which in places almost block the river. Canoeing, kayaking and other water sports can all be dangerous. This article is intended as a guide for experienced canoeists only.